Before Wonder Woman came along and stole all of its thunder, Logan had been the talk of the 2017 superhero realm. It was hailed as gritty and exciting and everyone loved the psychotic little girl who slashes everyone in sight. There's something happening in movies where people have begun to describe films as "gritty" that seem to fall much more into the first category than the second. Like Logan. 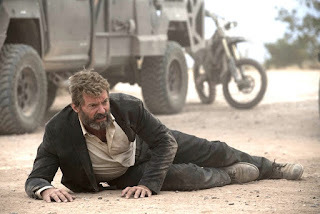 Do Wolverine and the other characters "show courage and resolve" in the movie? Sure, I suppose. Not more than any other typical comic book movie. Probably less so, actually. It is, however, shot in a dessert with a lot of dirt, dust, and later, blood everywhere. Which is why I'm convinced it got slapped with the "gritty" label in the first place. 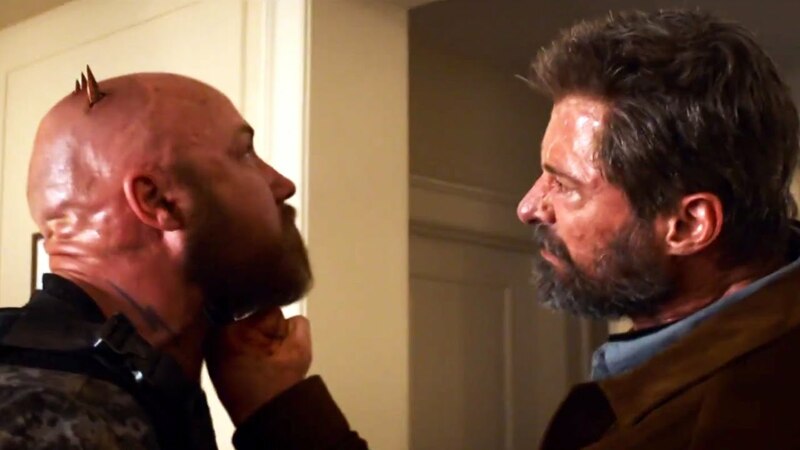 Just because he now goes by "Logan" and doesn't have his hair in the those cheesy wings doesn't suddenly make him gritty. I bring this up because this movie is dirty. Like, gross. Not just in a "people don't shower like in the Old West" kind of way, but also in a "people's heads are being literally chopped off and blood is spurting everywhere" horror movie kind of way. The combination obviously appeals to a wide audience, considering the box office numbers on this movie, but I really can't say why. I'll be the first to admit I am squeamish about violence. I think people can understand and appreciate the violence of a situation without having to see actual bodies being dismembered and such. But again, it seems like a certain segment of the population actually enjoys seeing copious amounts of blood spewing from slashed bodies, so this movie appeals to those people. For the rest of us, um, well, there's not much. Yes, the little girl is awesome. 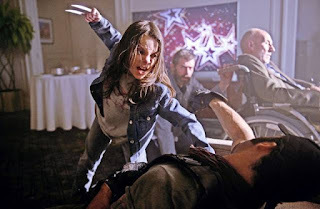 And yes, I suppose it's hypocritical to applaud a child for slashing adults with her tiny Wolverine claws after denouncing it for several paragraphs, but hey, she's taking on adults twice her size. It's obviously more impressive than the hulking Hugh Jackman that could probably beat up most people with his bare fists. Though the girl's action skills are the highlight of the movie, she doesn't speak much. So she's not so much a complete character as an awesome stunt person. 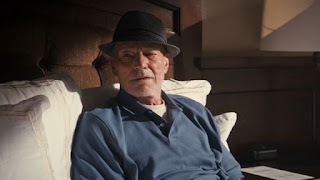 So for main characters, there's Wolverine, the same sulking, hulking character as always, a girl who doesn't talk, Stephen Merchant, who plays an albino whose white makeup looks like it's going to rub off any minute, and Patrick Stewart as Professor X, whom we need to talk about. First of all, didn't he die? Like, we all watched him evaporate in X3. I know this isn't a real universe, but WTF? No explanation, he's just suddenly there again. I would have been happy to see him instead of Jame McAvoy for a change, except he then executes the most awkward Spanish accent I've heard since my Chinese mother starting taking Spanish classes. Ven aqui! NON NON NON Patrick! No wonder the little girl doesn't talk. I wouldn't want to respond to him either. Except then at some point, he abandons the Spanish and just speaks English, which makes even less sense. Either he's speaking Spanish because he doesn't think she'll understand English, or he's just speaking Spanish to torture the audience. It's unclear, really. I just kept watching this movie, holding out hope for a big moment that would turn things around for me. I wanted to believe that my fellow movie watchers couldn't have gushed over this movie just because of some cool stunts from a child and a thin layer of dirt over everything. I mean yes, we'll all miss Wolverine (I mean, sort of), this being is last movie and all, but you can't pad his ratings just out of nostalgia. We deserve better! All I can say is that I watched this two days ago and the only things that stand out in my memory are: the little girl's stunts and Patrick Stewart's Spanish. If he doesn't win next year's Katherine Heigl Award, I will be shocked. Estupefacto! Final word: I'm sure we'll have to suffer through multiple spin-off series of other characters now, but thank God at least one is over.